Hi we are Sushiya Ginza! Very good Shari and some interesting sashimi settings. 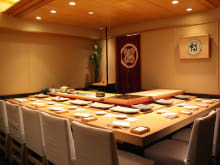 my favorite restaurant in Tokyo. Thank you!! An intimate and entertaining experience. The food journey was uplifting. We left dated & happy. The food transformed our mood. Outstanding! Best sushi I have ever had and I have had a lot! However, chef Takao Ishiyama is leaving this place very soon (in March I believe) to open his own place. So hurry up!